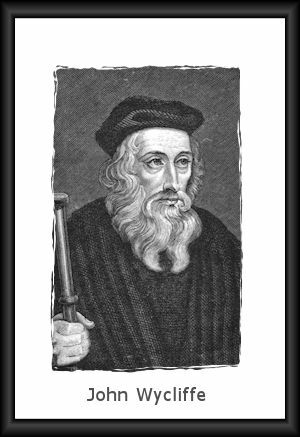 John Wycliffe (d. 1384) was an English preacher, writer and Bible translator who has been called "the morning star of the Reformation." He preached and wrote against various doctrines and practices of the Church of Rome, translated the Bible into English, and sent itinerant preachers (later called Lollards) throughout England to bring to the common people the the Word of God and the message of salvation through Jesus Christ. John Wycliffe, English reformer. Short biography. The Good Parson of Lutterworth, John Wycliffe. Short biography for boys and girls. John Wycliffe - The Morning Star (DVD) drama on the life of John Wycliffe. Gateway Films, ©1984.